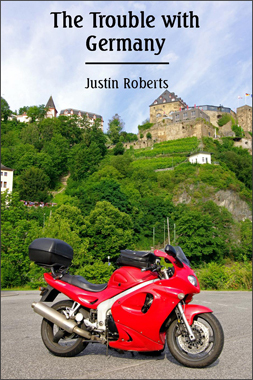 Introduction to The Trouble with Germany by Justin Roberts. Ireland, a country whose history of human occupation starts before anyone knows when, is defined in the eyes of many not just by its political and economic situation but also its social structure and the way in which it is perceived by the outside world, should the outside world be indulgent enough to look at all. It is little more than minor slab of rock, dating mainly from the carboniferous period and its greater part is covered in vegetation, be it the artificial grasslands and tillage of agriculture, the cool bogs of the uplands or poorly drained central plain. It is twice as wet on its western seaboard than on the east and is at a latitude comparable to Denmark, northern Germany and central Canada. Being attached right to the very edge of the European continent it is here that Europe is closest to America; just under 2,000 miles separate the two great Landmasses. 2,000 miles of sea that is as wet and briny over there as it is here. Nobody lives between the continents and although it may be said that Iceland is further west it is far to the north and sits atop, not the European tectonic plate, but a volcanic fissure that has created a landmass all of its own. But it is more than the ocean that divides the countries; there are the well documented and quite distinct gaps between the cultures and attitudes which are regularly trotted out in front of us by the media, and all this despite American society being, in the main, the spawn of European societies of just a couple of centuries ago. Living out here on Europe’s most westerly outpost I have often taken one of the bikes, the old Daytona or newer Sprint, and ridden out to the coast: the Burren, Sligo or Donegal and paused at the ocean edge to look out across the gently hued water, towards the Americas which lie at that vast distance. It is an experience to be recommended, especially away from the height of summer when the autumn storms of the sea, blowing far away over the horizon, are sending their shivering waves to crash in all their powerful glory upon the open coast. Each surge a rampart of clear water that is neither a vibrant verdant nor a deep blue, but a colour mixed from the two on nature’s pallet and toned with maybe a touch of grey. Every wall crowned with surf so white that the bubbles are barely distinguishable within the mop that mounts each peak. Without respite or break in regularity, they keep rolling in from some unseen tempest that is playing with the ocean as we would a basin of punch. When standing at the waters edge it is an experience that surpasses mere visual wonder, it will fill the soul and wash from within all lesser thoughts and emotions. It is hard to think of these as just waves, they are more guardians, set to the task of warning us mortals that the world is large and, ridden by the angels of foam, they drum into our conscience the fleetingness of time and the marvel of distance. These quantifiable but ungraspable elements of our world are to be respected for there is an awful quantity of both lying between us and our western cousins. Yet if I were to turn half way around to look inland, towards the heart of the island and beyond, to Britain, the Low Countries, the Alps and the Balkans, I’d know that the far side of Europe is even further away than the coast of the Americas with the eastern end of Crete being 200 miles more distant than Newfoundland. There is a whole continent wider than the Atlantic to explore and crossing it will take you as many miles as the well documented Route 66 will across America. And here I am on its very edge, a continent that is, on the surface, united as never before with minimal barriers, either physical or political, to travel. A land of well surfaced roads that now flow unhindered through countries that were at war in our grandparent’s time and in their grandparent’s time to. We now have at our disposal vehicles of such sophistication and quality that these thousands of miles may be covered with neither concern for reliability nor care for lack of comfort. Motorcycles, cars, trucks, buses and trains are all engineered to a different degree of excellence than from only a generation ago. A Ford or Austin from the 70’s was sat on a golden plinth if it’s milometer showed more than 100,000 miles, now such mileages are considered the norm for any car of a decade or more in age. Dependability, swiftness, speed, convenience are all words allied with modern travel so much so in fact that we really must distinguish between the romantic sense of travel as a mind expanding experience and travel as a form of routine transport from one location to another, glorified commuting in other words. The idea of passing from one continent to another was, until the very recent past, considered the very essence of ‘travel’ but now that it is routine, especially in the world of business, we may need to look for another word to describe the act of flying from A to B on to stay in a hermetically sealed hotel room indistinguishable from any other in its class anywhere else on the globe. Modern ‘travel’ is a form of processing, not enlightenment, and deserves a suitably derogatory phrase such as ‘transiting’ or ‘dungeon switching’. We would appear to live an enviable era, a golden age of jets and motorways and yet this is not yet nirvana, there is a tension resonating between the countries of this loose union with the various economies running at altogether different speeds whilst being shackled together through a common currency. The economic sense, or lunacy, depending on your views, of such an arrangement is the subject of many thousands of books, articles, blogs and forum threads the world over so it would be impossible to explore all the angles in just a week or a single book. Even so, it must be possible in some small way to garner an impression of how the Europe we now live in is operating. One of the great complaints about the present situation within the European Union is that it is dominated by just the one country, Germany. Although not alone in its desire to see a more united Europe the German government’s apparent pressure on the other nations to further integrate is not without precedent. The history of central Europe since the middle ages is one of a succession of wars, treaties and pacts that has gradually led to the establishment of the several nation states that we see today. We only need to go back 500 years to see a completely different political structure where the middle of the continent was divided up into much small autonomous states (known as electorates) and what passed for political power existed at a much more local level, confined to smaller areas called estates which are roughly synonymous to our present day counties or regions. The past inhabitants may well have not enjoyed the standard of life that we do but they suffered only mildly from the edicts and aspirations of the central command bloc which at that time was based in Austria, the Holy Roman Empire as it was known. This empire was certainly not a democratic construct even though the emperor was voted into place by the heads of the smaller states, hence their title of electors. These electors in turn were generally kings or dukes and were voted for by no one, certainly not their subjects, enjoying instead the right to rule through succession rather than the ballot box up until comparatively recent times. This is quite a different history to that of the UK and Ireland, and that difference must surely account for a part of the present attitudes towards Europe that are expressed in these countries, the act of travelling may well help provide a few clues as to how. The present desire of European leaders, to create a United States of Europe, mirrors that of the ambitions of one such electorate known as the Brandenburg principality in the 17th century. This state lay just south of the Baltic Sea and it eventually rose to become the highly influential state of Prussia before the allies wound it up in 1947. The desire to take control from the estates (especially the task of raising revenue) underpinned the lifetime's work of one of its greatest leaders, the Great Elector, Frederick William, who was at its head through much of the 1600’s. The Estates were allowed to retain a certain degree of ceremonial autonomy whilst the central state gathered and spent the money, mainly on armies and warfare. However, much good work was also done, such as controlling the grain supply through intervention in the open market ensuring that the ravages of famine were kept in check. Prussia’s evolution was certainly not smooth and it encompassed all sorts of diplomatic jiggery pokery and of course a series of battles and wars before it reached the point, in 1871, where she controlled over 40% of the Germanic lands and was in a position to ensure its head of state, King William, was crowned as the first emperor of Germany on unification of the states in that year. Does all this sound familiar? To anybody that is presently living in Ireland and has been trying to follow the various developments as they unfolded since the height the boom in 2006, the reflection of the current situation can be clearly see in the mirror of history. Prussia may well have been erased from the geographical and political map of Europe but the echoes of its past ethos are still reverberating around the continent and making themselves manifest in the insistence of closer ties and the desire to control free markets through intervention. The present ‘suggestion’ that the overall responsibility for raising tax in the European Union be transferred to Brussels from the member states is certainly an absolute continuation of this centralising theme and indeed, it underscores the trajectory of ever closer amalgamation that has its base in the wars of 16th century Europe. Five Hundred years is considered a long period of history and one could be forgiven that the events of half a millennium ago have little effect on current politics but I was not all sure that this was the case, so time to go and have a look for myself.